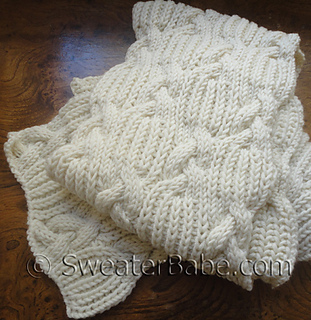 21 sts = approx 3 ¾“ 9.5 cm and 32 rows = approx 4.6” 11.7 cm in Cable Rib patt, blocked. Especially one that just exudes texture! 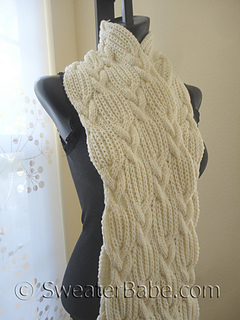 This one has plenty of texture, with loads of braided cable sections, combined and alternated with brioche rib. 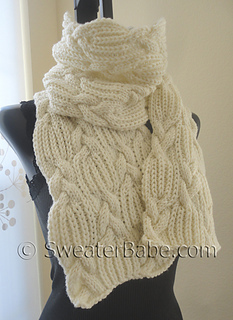 It’s a perfectly blended match that results in a fabulous winter white scarf. 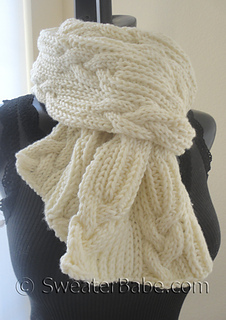 Knit in a very soft merino wool in winter white, this scarf is this season’s modern take on a winter classic!